Bell captain is the supervisor of Bell section in hotel or resort. He provides porter services to the guests with his team of Bell Boys. Bell Desk is situated in the lobby area. He has got the authority on bell boy’s activity and performance. Although his team (bell boys) is handling luggage and sometime works as a messenger but their job is no of less importance. 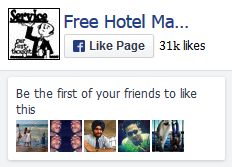 They also play a vital role in building hotel’s image. Every guest service is an important matter in hotel. To motivate bell boys towards quality guest service. To look after trim look, cleanliness, personal grooming and hygiene of all bell boys. To control the bell boy’s movement that they do not waste time in staff cafeteria. To prepare the duty roster and assign duty as per requirements. To maintain the minimum stock level of postal stamps. To train the bell boys about reporting and watching light baggage guest, who has got responsibilities of escaping without payment. To co-operate the reception regarding paging a guest. To maintain formalities of left baggage. To brief the bell boys about crew arrival/departure. To do other messenger duties as and when required by the management. 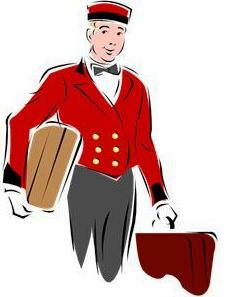 Bell Boys handle guest luggage at the time of arrival/departure or any luggage movement as and when required in the hotel. They report to the Bell Captain, shift duty Manager/Lobby manager. Bell desk is situated at their work station but they can move any areas of the hotel in case of the necessity for luggage handling. There must be someone at the bell desk all the time of meeting the guest service at any time. They work 8 hours a shift, round the clock. They co-ordinate mainly with reception and Front office Cash. Carrying guest luggage during arrival/departure or as and when required. While escorting a new guest with his luggage up to the room, the bell boys should inform the guest about room details. Providing postal services to the guests. Keeping left baggage in luggage store room after maintaining register book or log book. Checking the guest room while bringing down guest luggage at the time of departure whether mini bar and everything else are ok.
Co operating the reception to page in-house guest by paging board as and when required. Co operating the reception to check room physically to determine the discrepancy report. Reporting the reception about light baggage guest. Going outside to bring postal stamps or posting mail for guest or management.